The view of "Ynys Goch" from the hill behind with Eilian bay and lighthouse beyond. Watch this amazing drone video showing "Ynys Goch" from the skies - it's enchanting! We live in the old farmhouse of "Ynys Goch" situated next to the Cottage & about 50 yds from the caravan - and within the walled garden. In the main photo above "Ynys Goch" is the white traditional looking Welsh farm house just to the right of centre, the caravan being located to the left behind the trees and stable block. We also have a small cottage on site sleeping 2 persons adjacent to the main house. 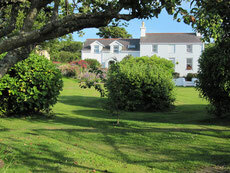 The original barn - now called "The Barn" is to the right and facing our cottage annexe. So if you want 'peace' with a stunning view then click here on reviews - and read on! 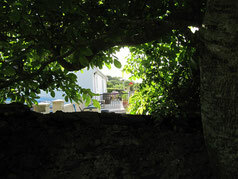 Below - looking from the walled garden through to the Spanish terrace.